Farrar, Straus and Giroux (BYR), 9780374380007, 112pp. 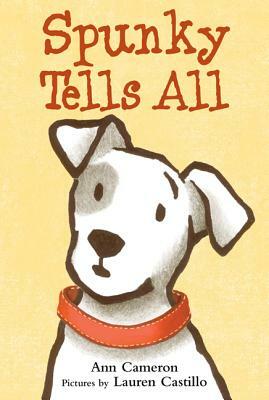 Spunky the dog would be happy to share all of his secrets, if only his human family spoke his language. But no matter how hard he tries to talk, it's all "yerf!" to them. Through a series of unfortunate miscommunications, his family decides that Spunky wants a friend--specifically, a cat. Spunky can't imagine anything worse than having to share his family, especially Huey and Julian, with the snobby Balinese Fiona. But when headstrong Fiona keeps getting into trouble and it's up to Spunky to save her, he is astonished to find that being her protector has given his life new purpose and meaning. The latest addition to the beloved Huey and Julian series, which includes the popular The Stories Julian Tells (featured on an Oprah.com summer reading list). Ann Cameron was born in Rice Lake, Wisconsin, in 1943 in the middle of an October blizzard. She grew up on a farm on the outskirts of that small town, and from the time she could walk she loved exploring it -- picking wild violets, staring into the eyes of cows and horses and chickens, puzzling over where the sun went when it set and wanting to follow it. She says: "When I was a child I fell in love with nature, imagination, and freedom. Later my childhood friends and I made up our own games. We spent lots of time outside, skiing, hiking, biking, and fishing. Our world seemed to us almost separate from the world of adults. I think the independence my childhood friends and I enjoyed is disappearing from the life of American children today, and I want them to feel it through my books." In third grade, Ann decided that when she grew up she wanted to be a writer. "I loved to read," she says, "but I didn't know anyone who was an author. I wasn't sure I could be one. I was afraid I couldn't. Every story I wrote as a child had behind it that terrible, troubling question: was it the story of someone who could become an author? If I could advise children who want to be authors and who perhaps worry as I did, I'd tell them to read a lot, learn all they can about what makes stories beautiful, powerful, and exciting, and not worry about the future." Ann graduated from Radcliffe College, where she studied with the poet Robert Lowell. He called one of her poems "magical" and encouraged her to keep writing. After graduating from college she worked in publishing in New York City, and studied at the University of Iowa Writers' Workshop, where she received an M.F.A. in English in 1972. Her first book for children, The Seed, was published in 1974. The book was inspired by a seed growing on her windowsill: transformed into a story, it became a young seed in the ground afraid to grow because it had heard a terrible storm in the unknown world above it. Ann's books about Julian Bates and his family found their beginning in stories told her by a South African friend, Julian DeWette. "I wanted to write stories that would include the emotions all children feel," Ann says. "Now that I've heard from children around the world who like my books, I'm delighted to find that I've really done it!" In 1983, Ann visited Guatemala and decided to divide her time between New York City and Guatemala. "I'd always felt that if I lived in another culture I'd learn other ways of seeing things and become a broader person than if I knew only one culture's outlook. Now I have years of living among Guatemalan people, some of whom are living on or over the edge of poverty. This is not a good thing, and it's not right. Yet the difficulties of living in Guatemala often teach people to recognize the impermanence of life and to value each day and each other more than material things. I try to do that, too." Ann now lives most of the year in Panajachel, Guatemala, the small town she calls San Pablo in her short novel The Most Beautiful Place in the World. She has worked to improve the Panajachel library so that Guatemalan children will have the same opportunity to read, learn, and dream that American children have. She is married to Bill Cherry, a former sailor, newspaper reporter, and editor, and retired staff director of a subcommittee of the U.S. House of Representatives. They live in view of three volcanoes, a beautiful lake, and a waterfall, in a small house with flowers growing over the roof and a lemon tree in the garden. I grew up in a little blue house near the water, on the North Shore of Long Island, New York. Living around the corner from the beach, I am told I learned to swim well before I began to walk. Most days were spent outdoors, and most weekends spent visiting my relatives that all lived nearby. Raised in an Armenian-Italian, Spanish-Irish family, I was exposed to a potpourri of cultural traditions. We celebrated a patchwork of holidays, foods, and music. I was surrounded by Spanish paintings, patterned walls and tapestries, old Armenian textiles, ornate furniture, beautiful ceramics, and, of course, lots and lots and lots of books—so many rich visuals that helped to expand and mold my visual vocabulary. I looked forward to weekend trips to my grandparents’ houses. Those trips always meant storytelling—storytelling, which stretched my imagination toward the entire world. When I was five, my parents packed up my younger brother and me and we said goodbye to our little blue house, our beach, and our grandparents, as we headed south to make our new home in the faraway countryside of Maryland. Moving away from the family was hard, but my brother and I found plenty to entertain us. We had big imaginations and were always creating—games, plays, stories, pictures, and settings, we did it all. We discovered a local pool to replace our old beach, and spent the rest of our time exploring, hiking, fishing, photographing, and drawing. My parents encouraged my love for drawing, and kept a stock of sketchbooks to hold my daily doodles and stories. By the time I entered middle school, drawing was my biggest pasttime. I drew on just about everything—even corners of test papers and handouts, which sometimes got me in trouble with teachers! And it was my high school art teacher, also a freelance illustrator, who introduced me to the world of illustration. He challenged and encouraged my talents, and helped me prepare my application for the Maryland Institute College of Art. Accepted and thrilled, I packed my bags for Baltimore in the fall of 1999. As an illustration major I studied many different aspects of the field, but it was a children’s book class during my junior year that made very clear which path I would take. The following summer I had the opportunity to study abroad in Southern Italy – an invaluable experience that opened my eyes to the world of visual journalism. I spent the entire trip exploring, recording my encounters and locations through drawings in my sketchbook. And I used my final college year to create a children’s book based on my summer abroad. It was that trip and that book which inspired me to apply to the master’s program in Illustration as Visual Essay at the School of Visual Arts in New York City. I moved back to my New York roots in fall 2003, attending the School of Visual Arts while persistently bothering many editors and art directors with portfolio drop-offs and meetings. I graduated in spring 2005 and was offered an internship with Henry Holt Books for Young Readers, where I learned a great deal about the publishing industry. Shortly thereafter, I received my first children’s book deal! I have been very fortunate to have had the opportunity to work with wonderful, talented editors who have paired me with equally wonderful, talented authors I’ve admired over the years. It is important for me to be able to relate the stories I illustrate to my own life experiences. I have the most fun incorporating bits and pieces of my own world into my illustrations—an occasional pattern from my grandparents’ wall, an old lamp from my parents’ living room, or a hilarious canine family member. I’ve even had the opportunity to travel back to that little blue house on Long Island, exploring and sketching for a story that takes place by the water! I am currently illustrating full-time for children’s literature in Brooklyn, New York, and continue to collect inspiration through a visual journal of my own responses to the ethnicities of New York City. Lauren Castillo is the author-illustrator of many books for young children, including the Caldecott Honor–winning Nana in the City, Melvin and the Boy and The Reader, written by Amy Hest.